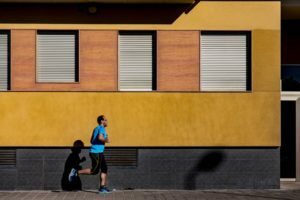 What is Graduated Compression for Compression Socks? Why Are Compression Pants Good for Sports and Working Out? What are the Benefits of a Compression Sleeve for Basketball? Is there a Difference Between Compression Shorts and Underwear? While exercise and diet are still the way to go for a healthy body, a waist trimmer is an added solution to help you reach your goal of a fit body faster. Think of it as an extra tool to help naturally slim down some weight in the stomach. While there are additional small benefits, these six provide enough reasons you need to invest in a waist trimmer belt or shaper today. I reviewed the five best waist trimmers on the market right now that feature everything I mentioned previously so that it can help you achieve your fitness goals in the future. One of the best waist trimmers you can get today is the TNT Pro Series Belt. One of the most popular waist trimmers on the market, it includes a premium build quality and effectiveness that is popular to use for working out. It accommodates almost all sizes of individuals with the extra wide design with the ability to loosen it or tighten it. You can expect comfort for long-term just from the fact you can choose how tight the belt is worn. But the effect of this belt comes into play during its use. The Velcro closure provides a secure fit whether weight lifting or running and wraps comfortably around the abdomen. During a workout, you can expect minimal sweat to accumulate around the abs. This sweat management helps to reduce some of the water weight that builds in the stomach. And after the workout when you take off the belt, you can see all the sweat that the belt repelled. 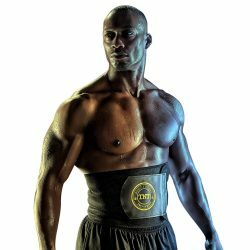 If you want a high-quality waist trimmer belt today, I recommend taking a look at the TNT Pro Series Waist Trimmer. 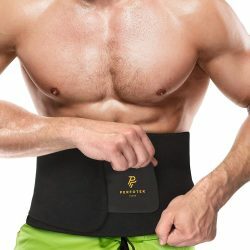 If you’re on a budget and need a belt that has an effective application, I recommend getting this waist trimmer belt by Perfotek. While the belt is cheaper compared to my top pick, it still provides a great shaping experience for a workout with the base requirements you can expect of a waist trimmer belt. This belt is perfect for stabilizing your core for a workout. 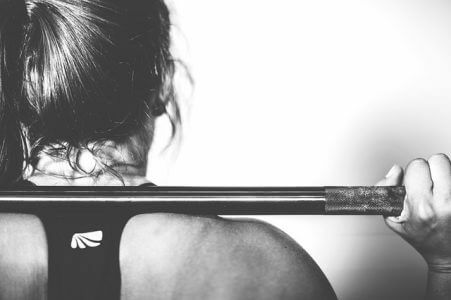 You could use this on your lifting days for squats and deadlifts, and also on the days you for a run to ensure proper running form and posture. While wearing this during a workout you don’t feel much sweat seeping in, but once you take it off the belt is drenched. Also, you can feel my abs and stomach area tighten after wearing it for the duration of your workout. 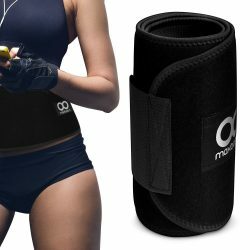 After consistent use, this waist trimmer belt can help trim and shape some of the stomach and belly fat which is excellent for the price. If you need an ab belt for occasional use for support and trimming, I would recommend getting the Perfotek Waist Trimmer. Regarding quality, the Sports Research Waist Trimmer boasts robust construction and design that is comfortable, yet effective. The high-grade quality is breathable and can be easily worn and wrapped around the abdomen and provides secure closure. You can trust this belt to stay in place during a workout. But the feature that differentiates this trimmer compared to its competitors is its effectiveness in sweating out water weight. It repels and prevents most sweat and moisture which reduces added weight in the stomach. It is one of the best waist trimmers regarding popularity and has helped several individuals reduce some size in the stomach area. While you won’t see overnight results, this waist trimmer provides a boost to your workout and fitness. 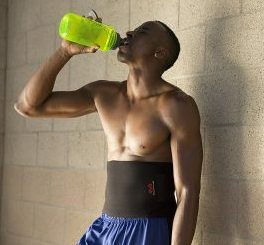 Another favorite waist trimmer that comes in at a competitive price point is this ab belt from Maxboost. It is an entry level ab belt that is ideal for both men and women to use. Its one size fits all design allows you to adjust it to your preferred looseness (or tightness). One thing of note that this waist trimmer does well is the reduction of chafing and irritation throughout the wear. With lower-priced waist trimmers, you have to be careful of harmful belts, but the Maxboost promotes comfort throughout each exercise. And on top of that, the neoprene material of the belt securely fastens to your waist that won’t burden you during an exercise or workout. While the comfort factor is one of its best selling points, I also think its slimmer construction compared to other belts makes it less noticeable if worn under clothes. If you want to be inconspicuous and wear it to the gym for its added benefits, I recommend getting the Maxboost Waist Trimmer. Regarding brand recognition and trust, McDavid has made quality compression products all around. And it is no different with their lightweight waist trimmer. Their trimming belt compression factor provides a comfortable pressure on the waist. This pressure helps with supporting the lower back and lumbar region while providing enough support for good posture/form in the gym. But the most important thing it helps with is weight loss. Don’t expect immediate results. But this waist belt is a simple solution to shave some of the tummy weight and shape it down. Just put it on before you run or lift and take it off at the end. You will drench it by the end of your workout; this is a good sign. It means you’re sweating away some of those pounds. Thanks to the lightweight build of the belt, it can be worn under clothes as well if you don’t want to wear it on the outside of your clothes at the gym or in public. I would recommend getting this if you want a trusted brand with excellent customer support and service if you end up having problems or issues.